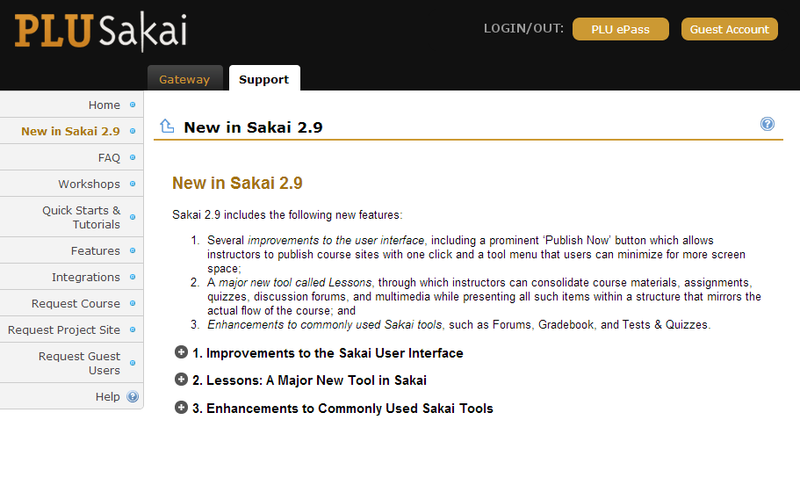 In a previous blog post and a corresponding email sent to all PLU employees last month about the Sakai upgrade to version 2.9 on Fri., June 6, we had alluded to forthcoming details about the new Lessons tool and other new features to expect from Sakai 2.9. Those details are now available. You can refer to them in the Sakai support site on a new page: New in Sakai 2.9. Therein you can drill down through the interactive headers to find screenshots and descriptions of the new features that will become available after the upgrade to Sakai on June 6. Included in these materials is a brief video that provides an overview of the Lessons tool. Through Lessons a course or project site in Sakai can be constructed and organized in a more cohesive and intuitive style than has been possible with previous versions of Sakai. Faculty and staff still have time to register here for the following workshops occurring within the next two weeks. The New Sakai Lessons Tool – The Sakai Lessons Tool allows instructors to present course content in a structured way to guide students through their learning tasks. Using the Lessons tool, you can organize resources, assessments, forums, and media into a topical (rather than tool) structure so that students don’t need to navigate to different tools. We look forward to working with you in making the most of these new features in Sakai. If you have questions or concerns, please don’t hesitate to email us at sakai@plu.edu.